Authentic Caribbean Rum (ACR) is made in 15 territories around the Caribbean: Antigua & Barbuda, the Bahamas, Barbados, Belize, Dominica, Dominican Republic, Grenada, Guyana, Haiti, Jamaica, St Kitts and Nevis, St Lucia, St. Vincent and the Grenadines, Suriname, Trinidad and Tobago – and is produced in many different distilleries. Irrespective of geography, each shares a passion for creating high quality rums. With each brand presenting its own distinct history, production process, style and flavour, it is this combination of shared values and diversity of character which makes Authentic Caribbean Rums unique. To help trade and consumers pick out those authentic brands that are part of this unique Caribbean family, WIRSPA has launched a new marque. Designed to serve as a visual symbol of provenance and quality, the marque may be used by eligible brands and will form the basis of a major Authentic Caribbean Rum marketing campaign. The production processes used to create Authentic Caribbean Rums are as diverse as the brands themselves. Variations in the arts of distillation, ageing and blending ensure a wide choice to suit different palates and serving styles. In order to help consumers appreciate these variations, while also identifying those that have been matured and which represent the best of the art and craft of each producer, the Authentic Caribbean Rum Marque will be applied using a three-tier classification system. It is a voluntary system and companies may apply to use the classification appropriate to their product. Rum is experiencing a global renaissance. Perhaps this isn’t surprising as it may confidently lay claim to being the most prolific and most variable of all of the world’s spirits. Defying all attempts at generalisation, rum, unlike many other spirits, really can be seen as a drink with a global footprint and a worldwide audience. Nevertheless, the Caribbean is recognised as the spiritual centre of the rum world. The spirit we know as rum today has evolved with the sugar industry of the colonial Caribbean world and remains one of the major industries within the Caribbean, responsible for a significant proportion of income for the region. Most of the world’s great rums originate from the Caribbean and it is here that the Rum Masters practice an art form that is steeped in history. There are as many interpretations of what constitutes great rum as there are countries which produce it. In addition to the heartland of the Caribbean, significant rum producing countries and regions include Australia, India, Madagascar, Mauritius, New Zealand, Philippines, Reunion, South Africa plus South and Central America. Rum is also blended and bottled in places as diverse as Austria, Newfoundland, France, Tennessee, Germany and the Netherlands. So whichever way you look at it, drinking rum is a truly geographic experience and a particularly tasteful way to travel. 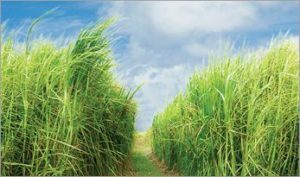 Although cane spirits were being made wherever sugar was being grown (the plant itself is generally agreed to originate from Papua New Guinea) long before sugar became the Caribbean cash crop, the rums of the Caribbean soon rose to the top of pile. In the seventeenth century, one writer described the clear spirit he found in Barbados as “hot, hellish and terrible”. A few years later things had moved on. A Dutch sea captain returned from the West Indies and wrote “the spirits are now smoother to the tongue and have acquired a golden colour during the voyage”. By the eighteenth century a hogshead of the finest aged Barbados rum was judged fit for George Washington’s inauguration party. No doubt spurred on by this vote of confidence, Caribbean rum producers have spent the ensuing two centuries perfecting the arts of distillation, ageing and blending. Today, almost all rum is aged in oak barrels allowing the spirit to acquire a golden to dark brown hue. 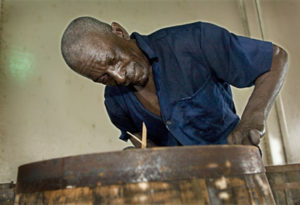 Equally, if not more important than ageing, the final stage of production is blending – the point at which a number of rums are skilfully combined with the personality of the countries and a shot of heritage to produce something uniquely Caribbean – True Rum.